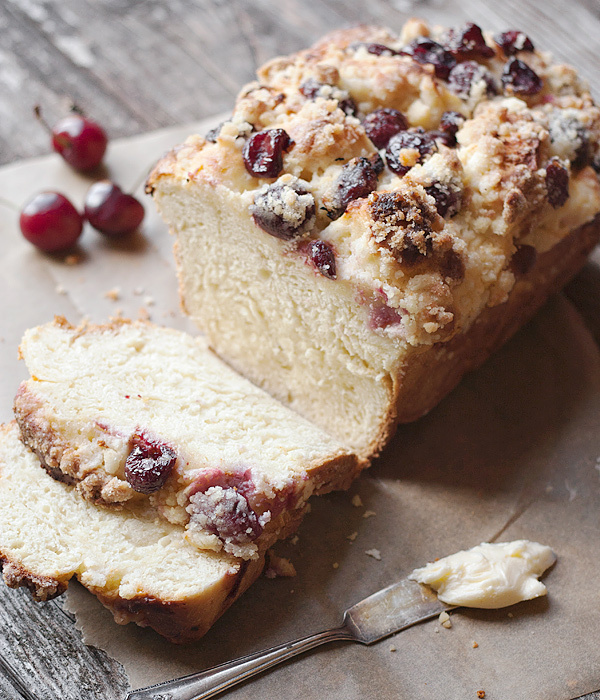 A delicious fresh cherry yeast bread, topped with dollops of cream cheese and a crumble topping. I have a thing for cherries and sweet yeast bread. I think they just are so perfect together. And with beautiful, fresh cherries showing up in the markets, it was time to bake a little something. 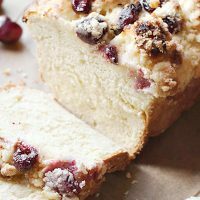 This is a new bread for me, a mash-up of a number of sweet bread ideas I have come across, combined with a technique I have used a few times – chopping the dough into chunks (like my Chopped Caramel Apple Bread). You may be wondering what purpose the chopping part plays in this bread. 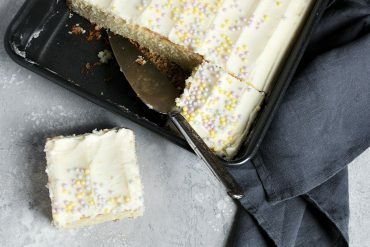 It’s quite simple – it makes nooks and crannies for the topping. If it weren’t for those nooks and crannies, all the cherries and crumble would roll right off as the bread rose as it cooked. I think we can agree that would be a darned shame. Even with the nooks and crannies, the cherries need a little coaxing to stay on top of the bread. I relied on the cream cheese to provide a bit of “glue” and placed the cherries right on top of the dollops of cream cheese, to help them stay put. I wondered afterwards if I should have put some cherries in with the chopped dough, so there would be some fruit in the main part of the bread, as well. I think I might try it next time, maybe cutting those cherries into smaller pieces to make the bread easy to cut. I’ll let you know how it works out. I should note that despite the topping, you can toast this bread. In fact, it is lovely toasted. I find the slices are tall enough that the top sticks up above the heating elements, so only the bottom bread part toasts. 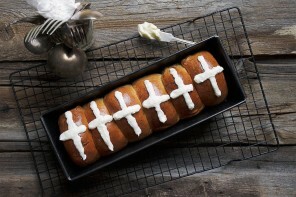 With a little butter and a cup of tea, it’s a perfect morning or afternoon treat. 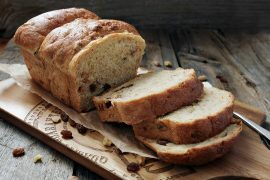 This is a wonderful breakfast or tea time sweet bread, delicious eaten out of hand or toasted. Yes, you can toast this bread in a toaster! Be sure to bake this bread the full time specified, even if it looks done sooner. If it's browning too quickly, loosely place a piece of foil over the top for the last part of baking. Make Dough: Warm milk and add yeast. Let stand 5 minutes. Meanwhile, in a large bowl or the bowl of your stand mixer with a dough hook, add 3 cups flour, salt and sugar. Mix to combine. Add milk/yeast mixture, butter and egg yolk. Knead with mixer or by hand, adding more milk or flour as necessary to form a smooth, moist (but not sticky) dough. Place in an oiled bowl, cover and leave to rise for 1 - 1 1/2 hours, or until not quite doubled. While dough is rising, halve and pit the cherries and set aside. Make the crumb topping by mixing together the flour and sugar and stirring in the melted butter. Set aside. In another small bowl, mix together the cream cheese and sugar until smooth. Refrigerate until needed. Remove dough to a cutting board. Deflated slightly then using a sharp knife, cut dough into 1-inch pieces. Grease an 8x4-inch loaf pan and throw the dough pieces into the pan evenly. 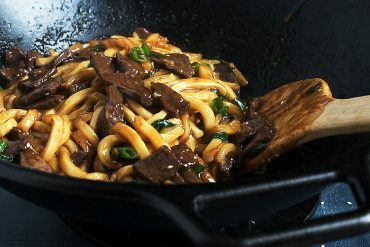 Cover pan and let rise for 30 minutes. 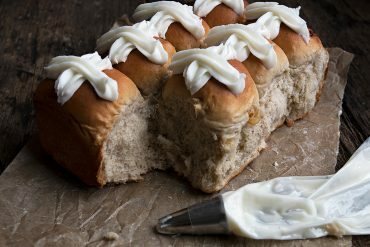 Preheat oven to 375° F.
When dough is ready to be baked, drop small spoonfuls of the cream cheese mixture over the top of bread. 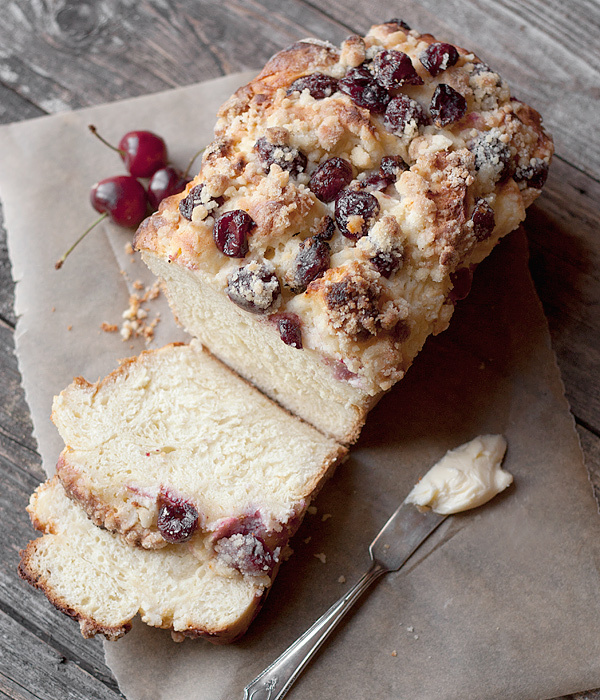 Place halved cherries on top of the cream cheese dollops and sprinkle crumble over the entire top of the bread. Place the loaf pan on top of a baking sheet (just as a precaution, to catch any cherries that might roll off during baking) and bake in the pre-heated oven for 40-45 minutes, rotating the pan halfway through baking. If necessary, place a piece of foil loosely over the top of the bread if it is browning too much in the last 10 or 15 minutes of baking. (Be sure to bake this bread close to 45 minutes, even if it looks done sooner, to ensure you don't have a gooey centre). Allow to cool in pan for about 5 minutes, then run knife around the edges and carefully remove the bread to a cooling rack to cool completely before slicing. Thanks for the kind words Yuri :) And thanks for cooking along. I think Canadians do tend to prefer things a little less sweet than Americans and definitely some French influences here. As for flour, I find all-purpose flour works pretty well for most breads. I do sometimes add a tiny bit of cake flour to bread, for a super light texture. I find bread flour works best for things like bagels and pizza crust (or some crusty, artisan-type breads). I just made it today ! This very good ! I wish I can show you mine. But I was using Black Cherry, so finishing color is a little bit darker . I was cheating make bread by hand instead, I just put bread ingredients into Bread machine ! It’s works ! But it seems like a little bit Dough is harder than I was expecting . Dough resting time instead 30 min, I did 50 min, because my bread machine dough is a little bit hard , so if dough is not enough rises up. I set parchment paper inside loaf pan as easy take it out after that. I was afraid of making crumble , because usually I thought using cold butter. But that is also no problem ! I made it nice crumble topping. One more thing worries me that about baking time. I did a little bit longer than 45 min. Because topping are not really brown at all, so I just do 10 minuets more baking longer. Result was outside crust was kind a hard . Another nice recipe one !! Thank you . 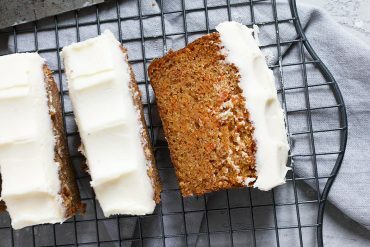 Can I using Bread Flour ? or Even Cake flour ? How do you think ? I would try bread flour. I think cake flour is too soft. 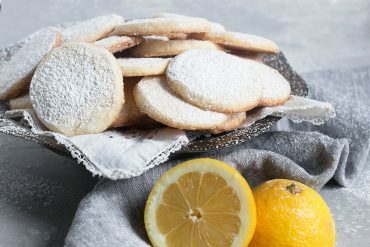 Is there a reason you don’t want to use all-purpose flour? 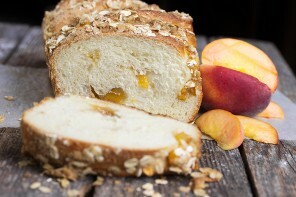 No, I just thinking about bread like this recipe . That’s why I thought if I do using bread flour, what kind of texture result……….. I will try all purpose flour first. Then I found you are Canadian. No wonder looks like and sweetness are influence from France I think. Not crazy sweet at all !! Excellent ! Oh this sounds simply perfect! There are no where near enough (Aussie summer) cherries in my freezer for all the fabulous recipes out right now! Thanks. I know what you mean. 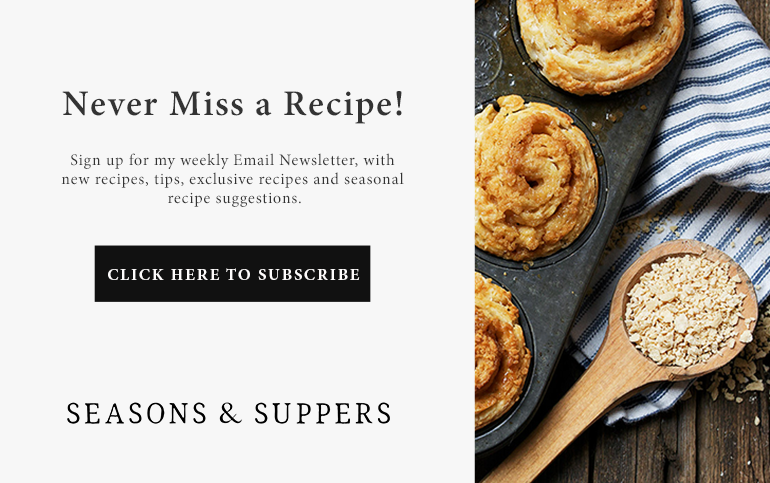 There are so many good recipes to try. Thanks Dina. It’s a great combination, for sure. this looks so yummy! i love cherries and cream cheese! Cherry season really is the best, isn’t it? How I would like a slice of this right now. You knocked it out of the park again Jennifer! Thanks Renee. I love cherry season, too. This looks fabulous! I love this topping. I look forward to trying this after I get my hands on some fresh cherries at the Farmer’s Market. Thanks Jennifer. I really enjoyed this bread and it stayed fresh for a surprisingly long time, too. I love the look of that topping! 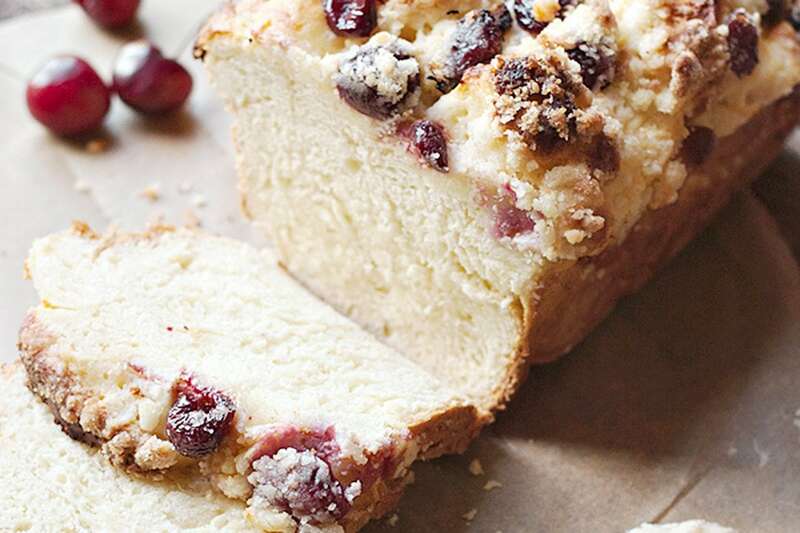 And although cherries would be lovely in the actual bread, it looks so beautiful with them clinging on to the top with those gorgeous crumbs. Such a gorgeous bread, I love that topping! Thanks. The topping is delicious and a bit different for a yeast bread.